On my trip to Kentucky this week to attend the PCA GA I took some time to do some geological sightseeing. I hope I can convince you that it was a lot more exciting that it might sound:-) Below are some pictures I took at two locations. The first are from the Falls of the Ohio State Park (in Indiana). Larger version of each can be viewed by clicking on the image. I make some limited comments about how these pictures relate to some of the themes of recent blog posts. 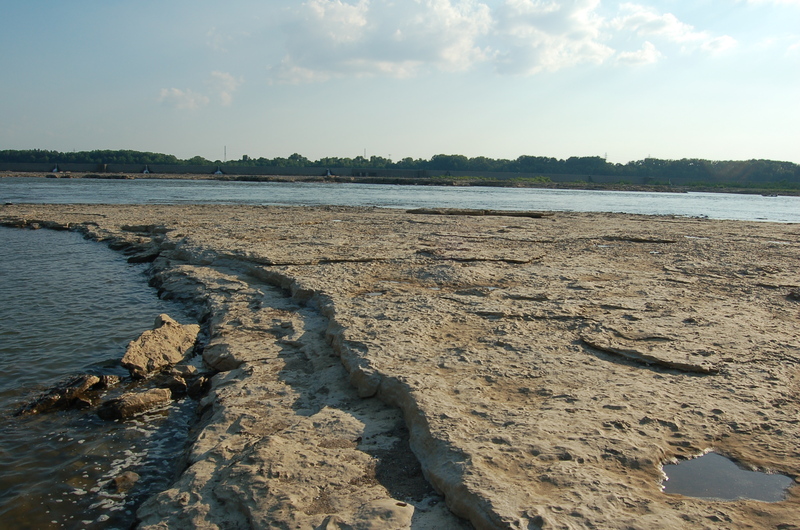 Looking out over the fossil reef appearing just above the Ohio River. 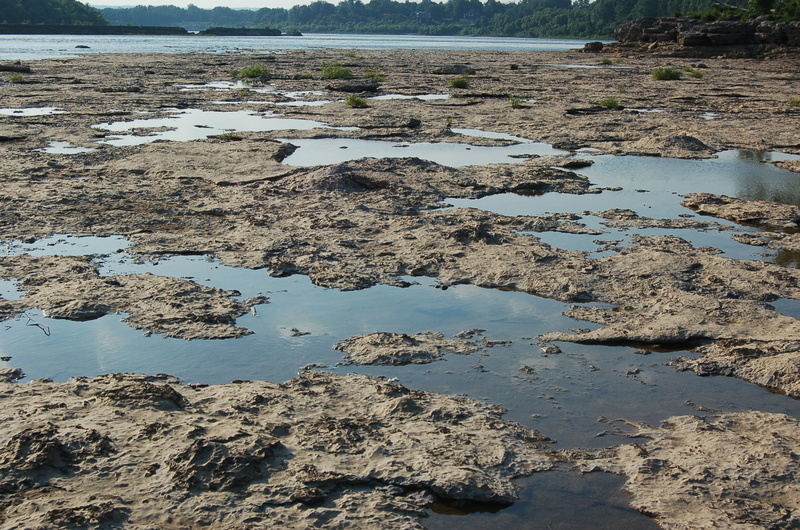 The reef appears again on the other side of the river and covers many hundreds of square miles under the hills of Kentucky and Indiana but is exposed here where the Ohio River has eroded the rock layers from above. 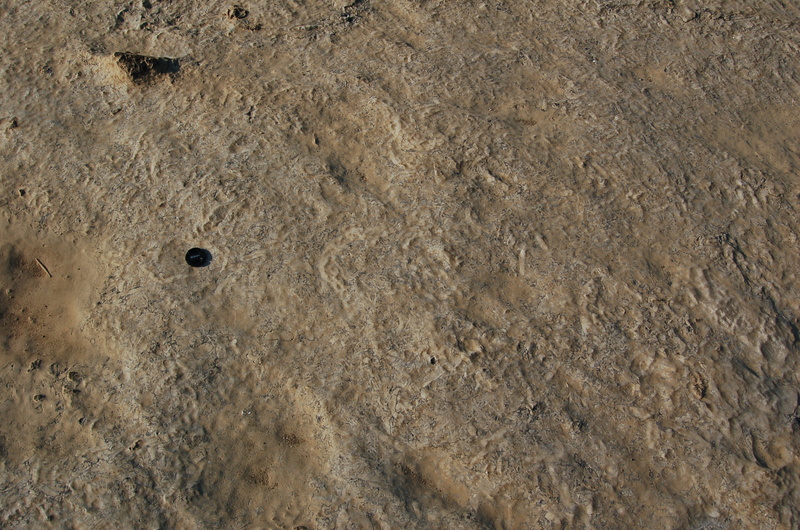 This is all fossil coral that you see in this picture. See close ups below. Image: Joel Duff – free to use with credit to this page. Click for much larger image. The Falls of the Ohio State Park really is a remarkable place. You can get right down to the Ohio River because there is a dam just upstream that redirects most of the water into a lock system. 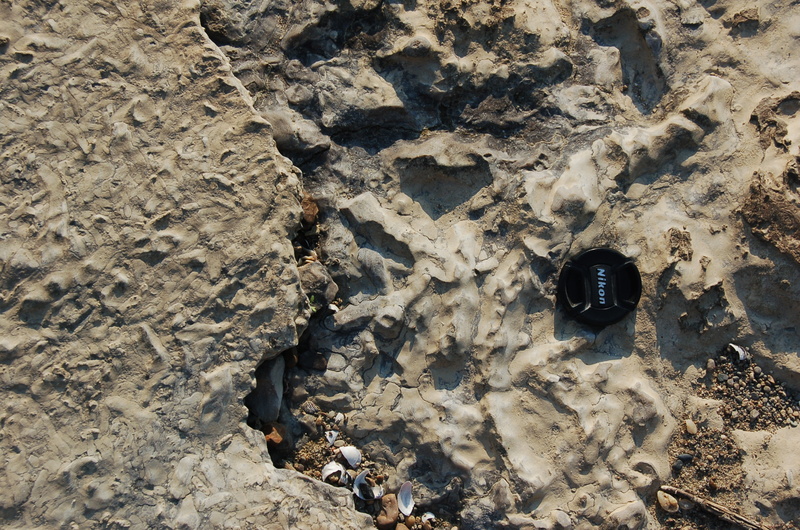 This spring has been dry in the Midwest and so the coral reef was fairly well exposed but in the fall there are times where the fossil reef is visible all the way across. 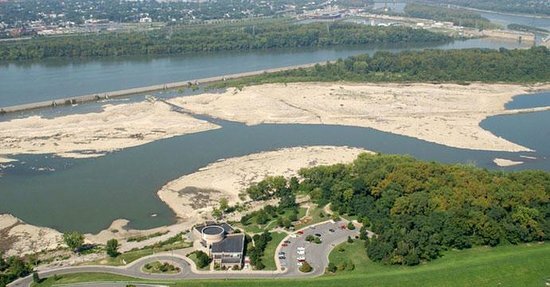 I wonder how many commissioners at the PCA General Assembly realized that the convention center in Louisville sits right on top of this huge coral reef? As they listened to a seminar on the age of the earth they were sitting on one of the most difficult forms of fossils to explain in the context of a young earth. If any of them crossed over to Indiana and walked down to the river’s edge they would have discovered a truly amazing fossil site. 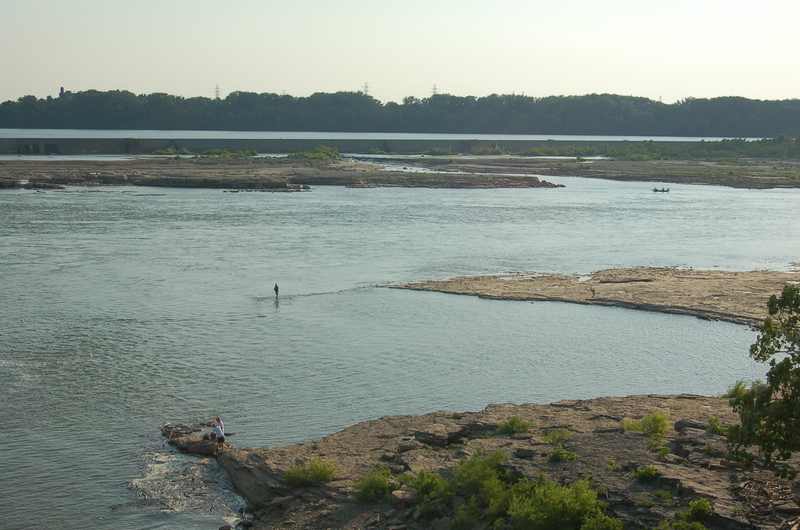 A view of the fossil coral reef from the visitor’s center of the Falls of the Ohio State Park. All the rock you see if fossil coral. When the Ohio River is very low you can walk all the way across this section because the remainder of the river is running through the locks. Image credit: Joel Duff – permission to use with credit to this address. The rocks layers you climb down to get to the reef have fossils but that doesn’t prepare you for what you are about to see when you get to the rocks that spread out over the floor of the river. 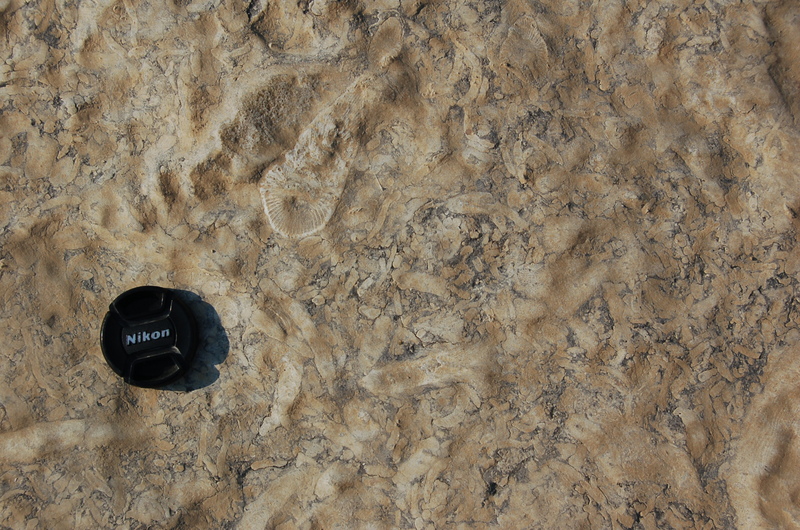 You end up walking out on a nearly smooth surface that is the eroded tops of a giant fossilized coral reef. 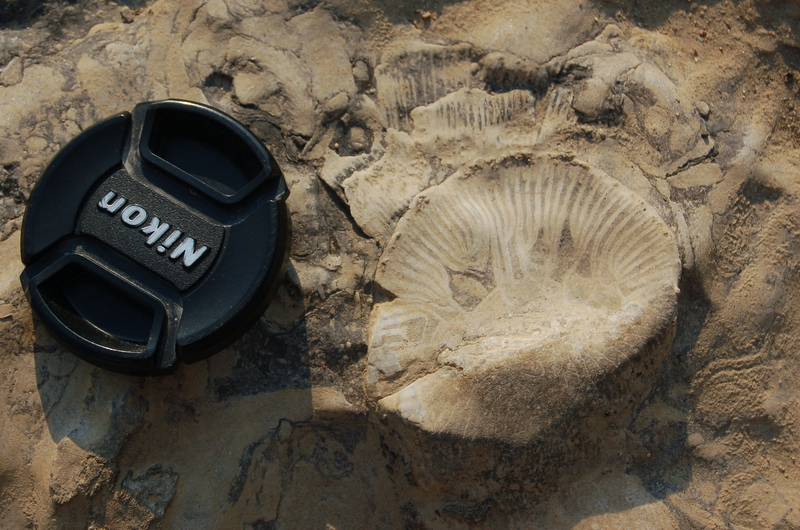 A spectacular fossil coral up-close showing the fine detail that is preserved in the fossilization process. Image credit: Joel Duff. Click image to get much closer. Fossilized reefs present one of the greatest challenges to the young earth models. The usual explanation is that the reefs represent reefs that existed prior to the Flood but were dislodged by the Flood and then deposited in the geological column. A visit to a site such as this immediately dispels such an idea. For one thing the size of the reef is enormous and it would be incredibly unlikely that such a large object could be transported hundreds or thousands of miles and floated onto several thousand feet of sediments below without itself being broken up. More importantly these reefs are very complex and it isn’t just a single reef. The picture above shows that the corals have grown in pancake type layers one on top of another. This strongly suggests a succession of reefs at the same location. One reef growing on another. Probably one reef was either drowned by rising sea levels or left high and dry by lower sea levels. Then when sea levels returned to a few feet above the old reef a new reef took hold and grew on top of the older and now dead reef. This must have happened many times at this location. Flood geology can not explain the multiple layers each of which would have taken hundreds of years to grow. Each layer is composed of a different combination of corals. If they had all grown together at one time why would there be a change in the types of coral used in each layer? 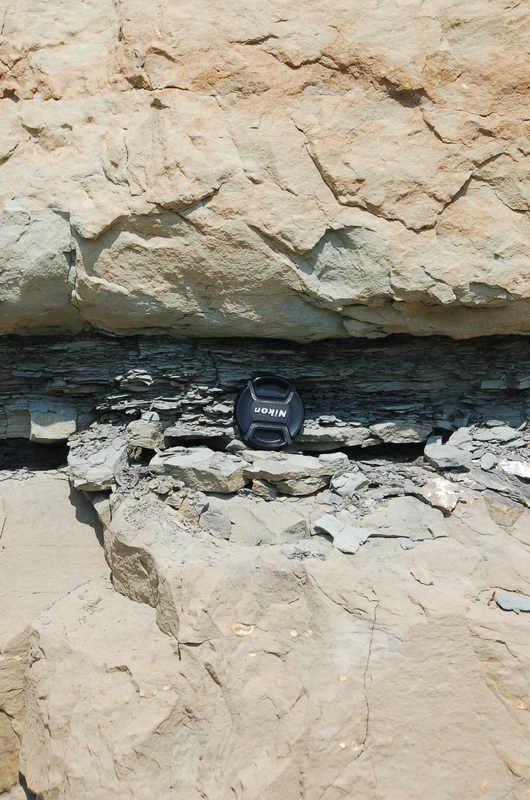 In the picture below you can see many layers of rock above the fossil reef layer. Even in each of these layers of rock there are thin layers of coral and other marine organisms so there were even other generations of coral although they are mixed with sedimentary layers of rock suggesting they were buried in sediments periodically. Below are pictures from a road cut just northeast of Louisville KY. Here is a road cut just off of I71 in Kentucky just northeast of Louisville. 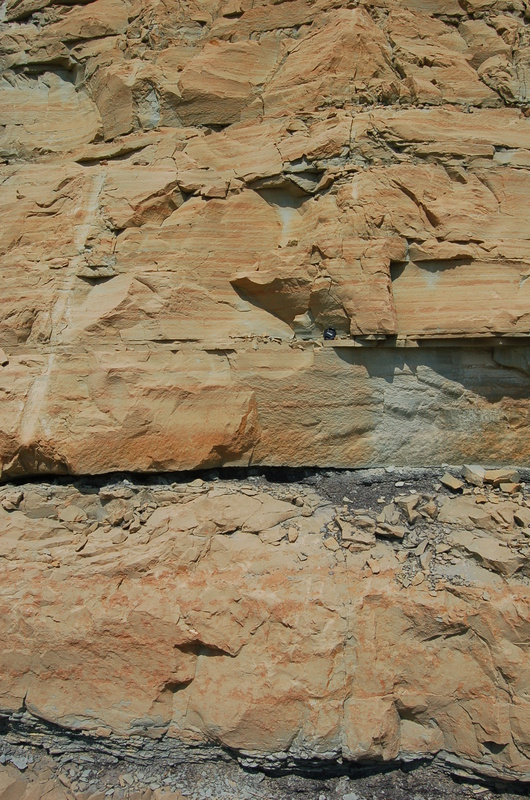 Here there are about 25 feet of hundreds of thin layers of rock most of which are loaded with marine fossils. Image: Joel Duff. This layer of limestone is chock full of fossils with some thin layers being composed of a greater percentage of fossils than rock. These are the types of marine fossil bearing rocks that I referred to in my article about the number of fossils in the fossil record. 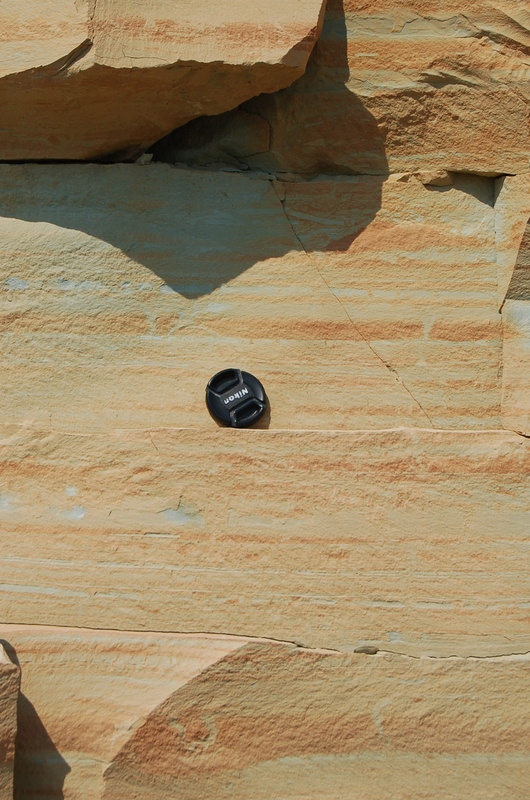 What is really remarkable about the picture above and below is the sharp distinction between the reddish rock and the black layers of rock that have fossils. These are the kinds of sharp breaks that flood geology has great difficulty explaining but conventional geology has little difficulty with. 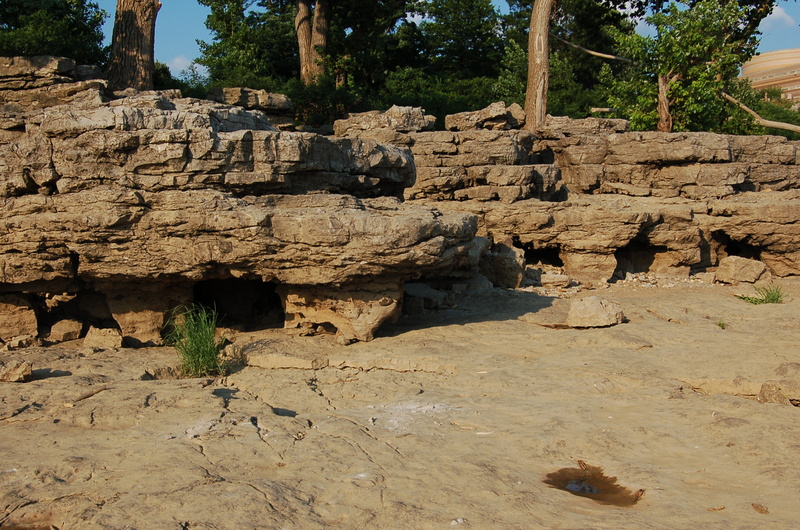 Really great rocks and fossils in Kentucky. In that state it is hard to find a location where you can’t find a fossil. Hello, Natural Historian, just a friendly reply to your comment about sharp breaks–I would argue that sharp contacts are exactly what would be expected from the erosive power of periodic large scale currents operating over very large areas. On the other hand, the extensive horizontal layers of different lithologies in your excellent photos are hard to analogize from modern reef systems. 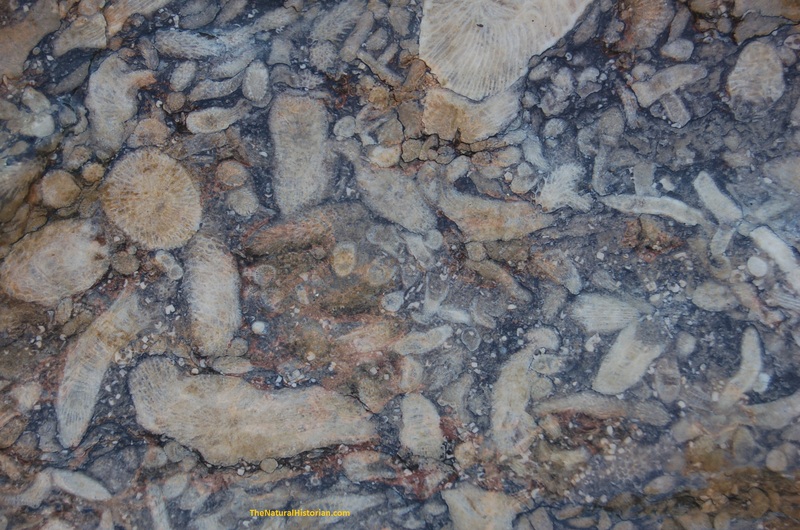 In addition, the closeup reef photos seem to indicate reef breccia, which would be expected to result from the strong currents of a catastrophic global marine transgression. In addition, examination of landscapes reveals that erosion, not deposition, is the dominant process on the earth today, and the laterally continuous and horizontal layers of even thickness seen in your photos are difficult to find currently in nature on the scale seen in the fossil record. HI SJ, thanks for the comments. You are quite right that close-ups of the reef fossils are more than likely an assortment of collected debris. These make for the prettiest pictures. what is remarkable about the location is that as one walks around on this varied reef/rock surface is that the character changes. There are areas of large reef organisms and then areas between that are filled with these more jumbled bits. It really is reminiscent of a modern reef that is not a 100% area of living coral but is patches of coral with dead debris zones. Where the waves are pounding the outer reef they are breaking up portions of the reef so that the interior will have a different look. This is what is seen in this reef complex. A highly varied set of conditions but clearly many corals have grown in place rather than being transported. There are thousands of feet of layered sediments below and several hundred above in the area so this is not just a collection of corals washed into place but they are cemented together in a community that resembles a modern community rather. Regarding the lateral continuous horizontal layers. I will grant that locations are not common though on some continental shelves and the black sea etc there are going to be incremental layers of quite even proportions forming. 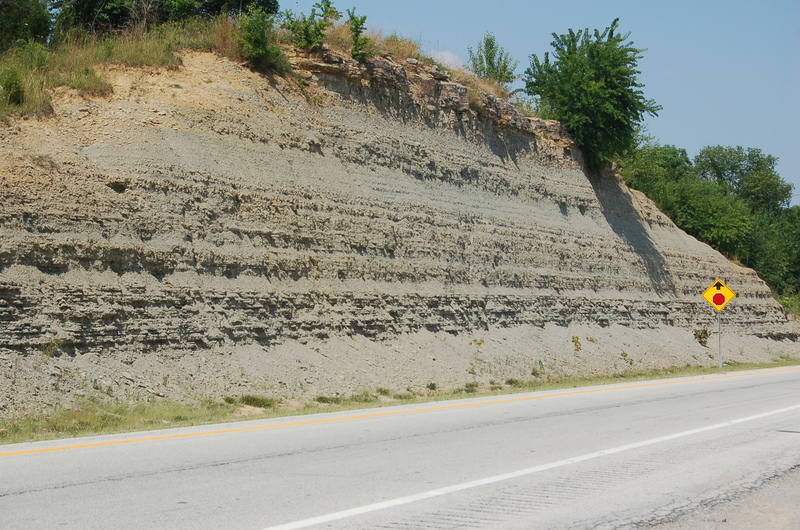 However, I do think that these layers we see here are the result of conditions that are different than we have today. When the entire Midwest was a shallow sea with higher sea levels thousands of square miles would have experienced similar depositional conditions and with changing salinity etc.. you would get changes in the text of the sediments. I don’t really see much of problem with their presence even if we don’t see them forming to this extent today. Just because something is not happening today doesn’t mean it didn’t happen in the past and that the evidence doesn’t’ support and point us to seeing that it did happen. I think we will just have to disagree about the sharp breaks. Such a beautiful post. I love the images. I will try to go there someday.